The Advisory Council of 1957-58 was mandated as part of the 1956 Amendments. The Amendments directed the appointment of the Council and mandated that Councils would thereafter be appointed on a regular basis just prior to any scheduled tax increase in the law. This was the first Council established as part of a permanent, ongoing, function. All prior Councils had been ad-hoc creations, either of the Executive or the Legislative Branch, and sometimes both. The charge to the 57-58 Council was to study the broad issue of Social Security financing and the particular issue of whether the tax rates scheduled in the law should be modified. Following the mandate of the law, the Secretary of Health, Education and Welfare (HEW), Marion Folsom, appointed the Council in October 1957. Members of the 1957-58 Advisory Council. 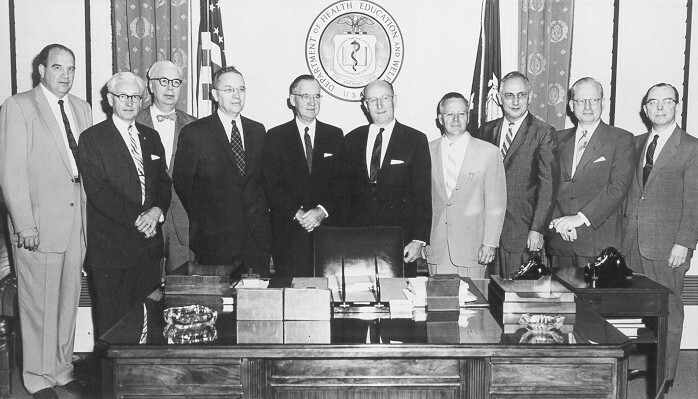 Left to right: Mr. Childs, Mr. Cruikshank, Mr. Hohaus, Dean Brown, Secretary Folsom, Commissioner Schottland, Mr. Fischer, Mr. Bryan, Mr. Hornby, and Dr. Hurd. Not present: Mr. Bell, Dr. Burns, Mr. Lloyd and Mr. Peterson. SSA History Archives.